Background : Dental amalgam is the primary direct posterior restorative material used worldwide, but it have certain shortcomings due to the lack of adhesiveness to the cavity. The introduction of the concept of "bonded amalgam" helped improve the use of amalgam as a restorative material. Aim : Evaluation of the comparative push-out shear bond strength of four types of conventional glass ionomers used to bond amalgam to tooth in simulated class I situations. Materials and Methods : Four chemical cure glass ionomers are used: GC Fuji I, GC Fuji II, GC Fuji III and GC Fuji VII, and are compared with unbonded amalgam. The push-out bond strength was tested using the Instron Universal Testing Machine at a crosshead speed of 0.5 mm/min. Statistical Analysis : One-way ANOVA and post hoc Bonferroni tests were used to analyze the data. Results : The results showed that the use of glass ionomer to bond amalgam resulted in an increase in the bond strength of amalgam. 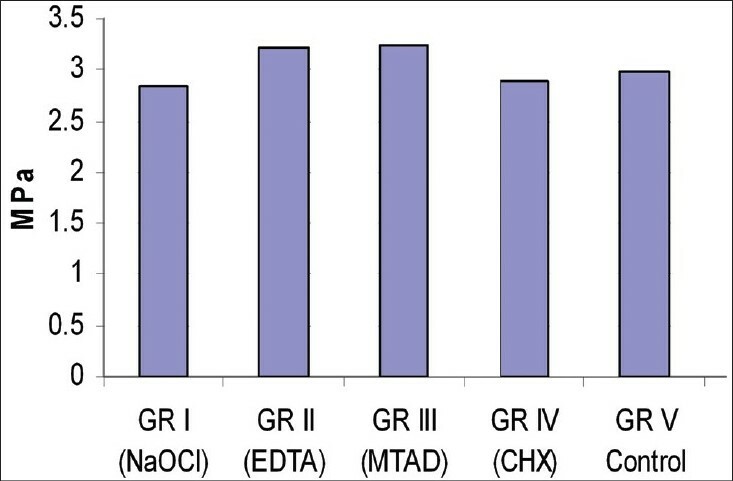 The Type VII glass ionomer showed the highest bond strength in comparison with the other glass ionomers. Conclusions : Conventional glass ionomer bonds to amalgam and shows a beneficial increase in the bond strength of the restoration in comparison with unbonded amalgam. Aim : To determine the effect of fiber and its orientation on the fracture resistance of composite restorations in root-filled premolars. Materials and Methods : 50 sound human premolars were collected and assigned to five groups of ten specimens each. In group 1 (control), specimens were not root-filled. In the other four groups, MOD cavities were prepared and the cusps were reduced to 1.5 mm. In groups 2 and 3, the samples were filled with Z-250 and spectrum composites respectively without fiber reinforcement. Groups 4 and 5 were reinforced with Fiber-Ribbon-(Angelus) and restored with spectrum composite. Fibers were placed in the U-shaped design in group 4 while they were placed in the cross-shape in occlusal region in group 5. The fracture resistance was tested using a mechanical testing machine at crosshead speed of 1mm/min. Results : The fracture strength of control group was 1271.16±722.04 N while it was 952.05±330.16 N for group 2, 918.52±256.6 N for group 3, 857.13±184.58 N for group 4 and 1138.81±406.64 N for group 5. Fracture strength of group 5 was more than other groups except for group 1, there was no statistically significant differences. Conclusions : The reinforcement of composite with fiber does not increase fracture resistance of root-filled premolars significantly. 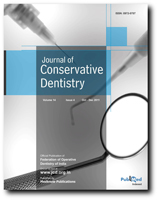 Aim : To aim of this study is to investigate the root canal characteristics of mandibular incisors in a North East Indian population using a canal staining and tooth-clearing technique. Materials and Methods : Four hundred and eighty extracted mandibular incisors, collected from dental clinics within North East India were selected for this study. Following pulp tissue removal, the teeth were decalcified with 5% nitric acid, dehydrated with ascending concentrations of alcohol and rendered clear by immersion in methyl salicylate. After staining of the canal systems with India ink, cleared teeth were examined under 5X magnification and the following features were evaluated: (i) number and type of root canals; (ii) presence and location of lateral canals and intercanal communications; (iii) location of apical foramina; and, (iv) Bifurcation of canals. Results : The majority of mandibular incisors had a single canal (63.75% of teeth possessed a Type I canal system). Although 36.25% of the roots possessed two canals, only 6.25% had two separate apical foramina. Conclusions : The prevalence of two canals in this group (of North East Indians) of mandibular incisors was 36.25% and is within the range of previous studies performed on populations of different racial origin. Aim : The aim was to evaluate the influence of water storage on fiber post-resin composite adhesion after different postsurface treatments. Materials and Methods : Forty-two fiber posts were used. Half of them were treated by hydrogen-peroxide and the other half were sandblasted. The adhesive (Single Bond, 3M, USA) was applied on the post. Core was built-up using flowable composite (Ζlite Flow, Bisco, USA). The specimens were divided into eight groups. Group 1 was treated with H 2 O 2 . Groups 2-4 were treated with H2O2 but stored for 3, 6, and 9 months, respectively. Groups 5-8 were sandblasted and stored for 0, 3, 6, and 9 months. μTBS was measured and data analyzed using one-way ANOVA and Tukey HSD. The fractured surfaces were evaluated by a stereomicroscope. The morphology of interfaces was assessed under SEM. H 2 O 2 -treated groups showed higher bond-strength. Results : The effect of "surface-treatment method" and "storage-time" was significant (P<0.0001), but there was no significant difference for their interaction effect (P=0.05). Water aging significantly decreased μTBS. Conclusions : Water aging significantly decreased microtensile bond strength regardless of the type of post surface treatment. Background : Before obturation, various endodontic solutions are used as a final rinse. These solutions might affect the bond strength of Resilon-Epiphany system. The aim of this study was to evaluate the effect of NaOCl (5.25%), chlorhexidine CHX (2%), EDTA solution (17%), and BioPure MTAD on push out bond strength of Resilon-Epiphany system. Materials and Methods : Seventy-five human premolar roots were prepared and divided on the basis of final endodontic solution rinse. The canals were obturated with Resilon-Epiphany system. All samples were restored using a fiber post system and indirect composite crown. The samples received 150 000 cycles of mechanical loading. Push out bond strength was performed in the apical third of root having Resilon obturation. Results and Conclusions : Different endodontic solutions tested, did not affected the push out bond strength of Resilon-Epiphany obturation system. Aim : In this study, we evaluated the effect of photopolymerization on Vickers microhardness of dual-polymerized resin cement at three locations when a translucent quartz fiber post was used. Materials and Methods : Single-rooted bovine teeth received quartz fiber post systems (length: 12 mm) using a dual-polymerized resin cement. In Group 1, the posts were cemented but not photopolymerized, and in Group 2, the posts were both cemented and photopolymerized. 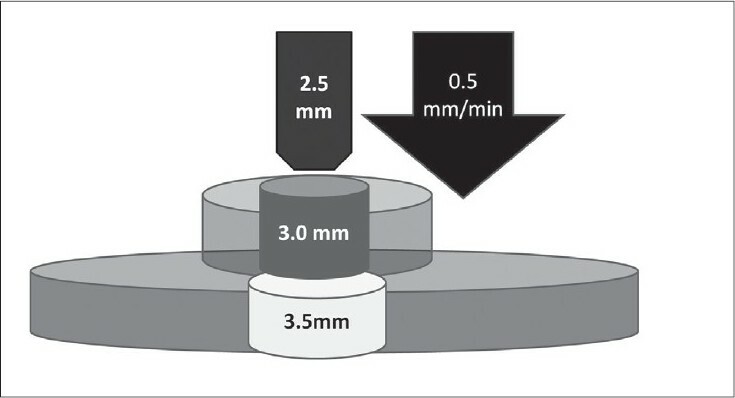 After cementation, approximately 1.5-mm thick sections were obtained (two cervical, two middle, and two apical) for regional microhardness evaluations. Statistical Analysis : Statistical analyses were performed using the SPSS software (ver. 11.0 for Windows; SPSS, Inc., Chicago, IL, USA). Microhardness (kg/mm 2 ) data were submitted to two-way analysis of variance (two-way ANOVA) and repeated measures with microhardness values as the dependent variable and polymerization status (two levels: with and without) and root region (three levels: cervical, middle, and apical) as independent variables. Multiple comparisons were made using Dunnett's T3 post-hoc test. P values of <0.05 were considered to indicate statistical significance in all tests. Results : Photopolymerization did not significantly change the microhardness values when compared with no photopolymerization. Microhardness values also showed no significant difference between the three regions in the root canals in both groups. Conclusions : The mode of polymerization of the cement tested in combination with the translucent quartz fiber post system did not affect the microhardness of the cement at the cervical, middle, or apical regions of the root. Aims : This study evaluated the effect of 2% chlorhexidine cavity disinfectant on microleakage in class II cavities restored with light cured composites using a single bottle adhesive in an in vitro model. 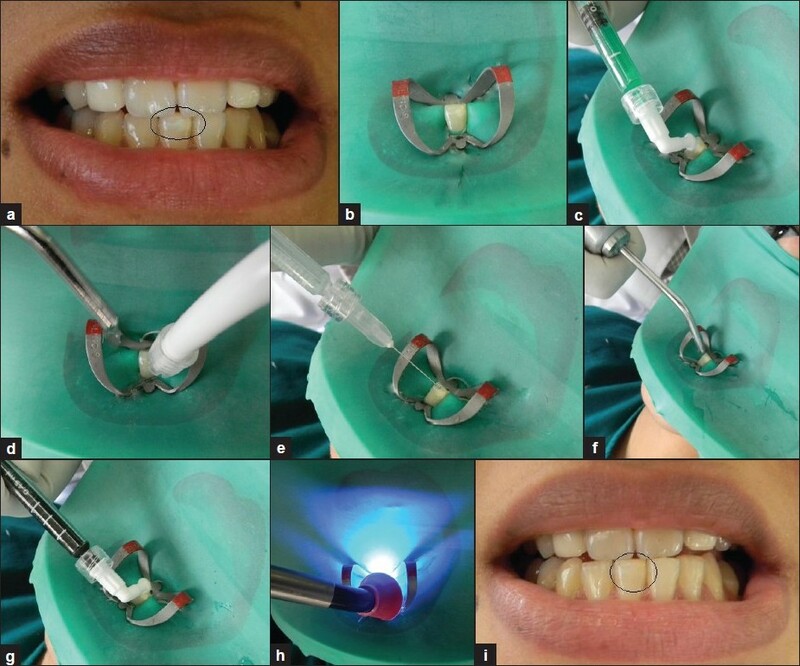 Materials and Methods : Proximal box cavities were prepared on mesial and distal surfaces of 40 non carious mandibular third molars, resulting in total of 80 cavities. Forty cavities on were rinsed with normal saline and 40 cavities were rinsed with 2% chlorhexidine cavity disinfectant. All cavities were restored with a single bottle adhesive and nano hybrid composite resin. Microleakage was evaluated at the gingival margin using methylene blue dye penetration method. Results and Conclusion : Chlorhexidine cavity disinfectants produced significantly higher microleakage while restoring the cavities using a self-etching single bottle adhesive. Aims : This study was undertaken to determine the effect of step-curing, ramp curing, single intensity on the effectiveness of cure and polymerization shrinkage of composite resin. The influence of filler loading on the effectiveness of cure and polymerization shrinkage of composite resin was investigated. Materials and Methods : In this study, a total of 80 specimens divided into four groups were used. Group I - specimens cured with the step-cure mode. Group II - specimens cured with single high intensity. Group III - specimens cured with the ramp-cure mode. Group IV - specimens cured with single low intensity. Each group had two subgroups based on the composite resins used for making the specimen. The effectiveness of cure was determined from surface hardness values obtained from Rockwell hardness testing. A mathematical volumetric method was used to assess the volumetric shrinkage. Results : Group III showed the best effectiveness of cure followed by group I and II. Group IV showed the least. Polymerization shrinkage was highest with group III and group II, were as was lowest for group I and IV. Charisma showed better effectiveness of cure and low polymerization shrinkage compared to Durafill VS. Conclusion : This study emphasizes on the fact that, the soft-start polymerization modes (step curing and ramp curing) should be preferentially used over the conventional single (high or low light) intensities to cure composite resins, as its use results in optimal properties. Background : Porcelain from prosthesis such as crown or bridge can be fractured if exposed to trauma; and, can be repaired at chairside using composite resin. 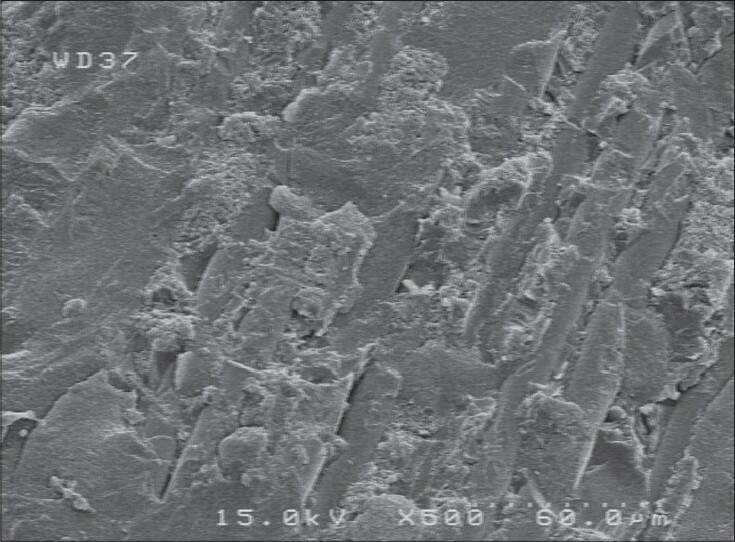 Aim : To investigate the fracture resistance of few techniques of surface preparation in repairing fractured porcelain using composite resin. Materials and Methods : Eighty samples of porcelain blocks were divided into 4 groups for different surface preparations, such as, Cimara repairing kit; porcelain etch kit containing hydrofluoric acid; Panavia F resin cement; and, sandblasting using aluminium oxide, before composite resin (Filtek Z250, 3M ESPE) was bonded to the prepared porcelain blocks. Twenty others samples in the control group comprised of pure porcelain blocks. The fracture resistance of each sample was tested using Instron machine (UK). 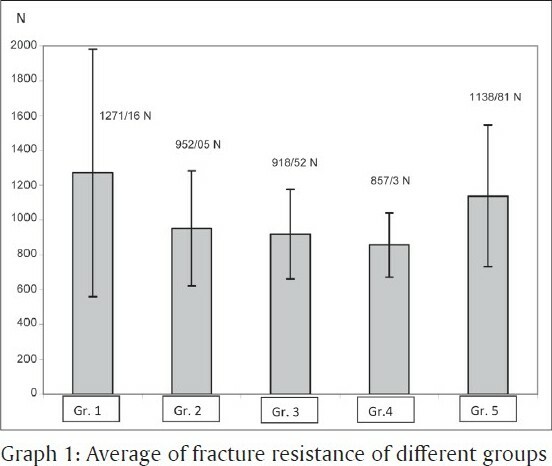 Results : With the exception of the group repaired using hydrofluoric acid (3.04±1.04 Mpa), all the other groups showed significant difference in the fracture resistance values when compared to the control group (3.05 ± 1.42 MPa) at P<0.05. Conclusions : Etching of the porcelain blocks with hydrofluoric acid holds promise in the repair of fractured porcelain with composite resin at chairside. Aim/Objective : To understand the importance of intensity of light in polymerizing light cured composites and its relation to color stability. Materials and Methods : Forty specimens of composite disc with 3mm diameter and 1.5 mm thick were divided into two groups of 20 samples each. Group1: Twenty samples were cured with a light curing unit of380mw/cm 2 . Group2: Twenty samples cured with a light curing unit of 680mw/cm 2 . These polymerized samples were immersed in methylene blue dye for 24hoursand later washed and immersed in absolute alcohol for 24 hours. 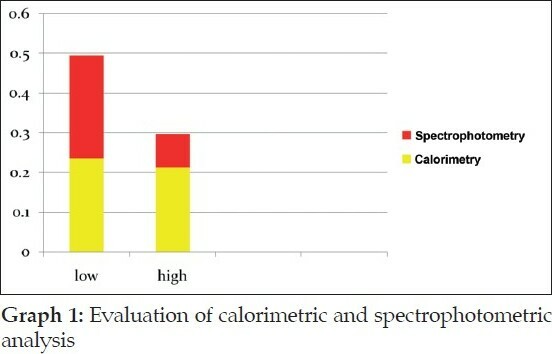 The amount of color released into absolute alcohol was assessed by spectrophotometric and colorimetric analysis. Results : Results were analyzed for spectrophotometric and colorimetric values by using the Mann-Whitney test. The group cured with low intensity light stained more compared to the group cured with a normal intensity of light. Conclusions : Intensity of light plays a crucial role in staining of the polymerized light cured composite. The intensity of the curing unit has to be maintained in acceptable limits to achieve good clinical results. 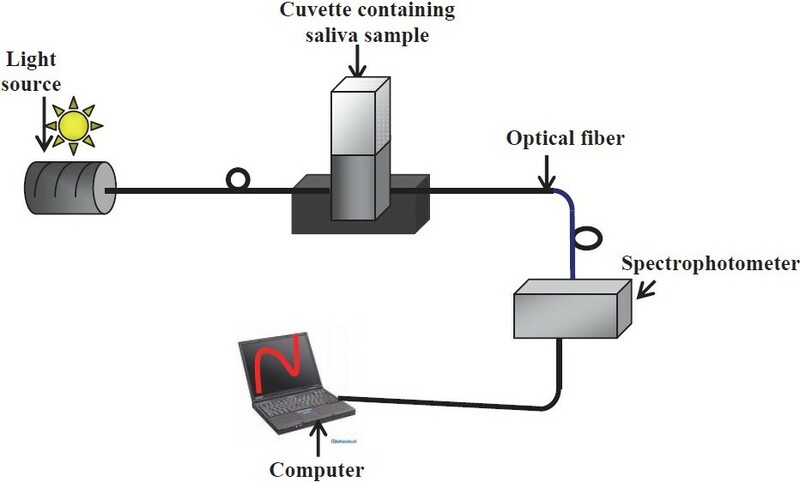 Objective : This study aimed to evaluate the ability of an optical spectroscopic sensor (OSS) to monitor bacterial-mediated acidogenic-profile of saliva resulting from bacteria-sucrose interaction. Materials and Methods : Stage-1, characterization experiments were conducted to standardize the OSS. Stage-2 clinical experiments were carried out on stimulated saliva samples from 70 children of age-group 1-12 years. The bacterial-mediated acidogenic-profile of saliva mixed with sucrose was monitored using the OSS for 180 minutes. Results : The clinical patients were categorized based on the dmfs score as caries-active, caries-inactive and caries-free. The bacterial-mediated acidogenic-profile measured in terms of t1/2 monitored using the OSS was significantly different between the caries-free and caries-active (P<0.05); and caries-free and caries-inactive groups (P<0.005). Conclusions : The significant correlation of the acidogenic-profile determined using the OSS and the caries-status highlighted the OSS as a sensitive and rapid chairside tool for the quantification of the acidogenic-profile of saliva that could help in monitoring the caries-risk in children. Objectives : To evaluate and compare the clinical performance of Giomer (Beautifil II) and RMGIC (Fuji II LC) in noncarious cervical lesions. Materials and Methods : Thirty-two subjects with one or two pairs of noncarious cervical lesions were included in the study. Each pair of lesion was restored with either giomer or RMGIC assigned randomly. Clinical evaluation of restorations was done using USPHS criteria. Data was formulated in a predesigned format and subjected to statistical analysis using the chi square test. Results : Statistically significant difference was found between RMGIC and Giomer with respect to surface roughness with P value <0.001. Conclusion : Giomer showed superior surface finish compared to RMGIC. Both Giomer and RMGIC showed equal retention ability. 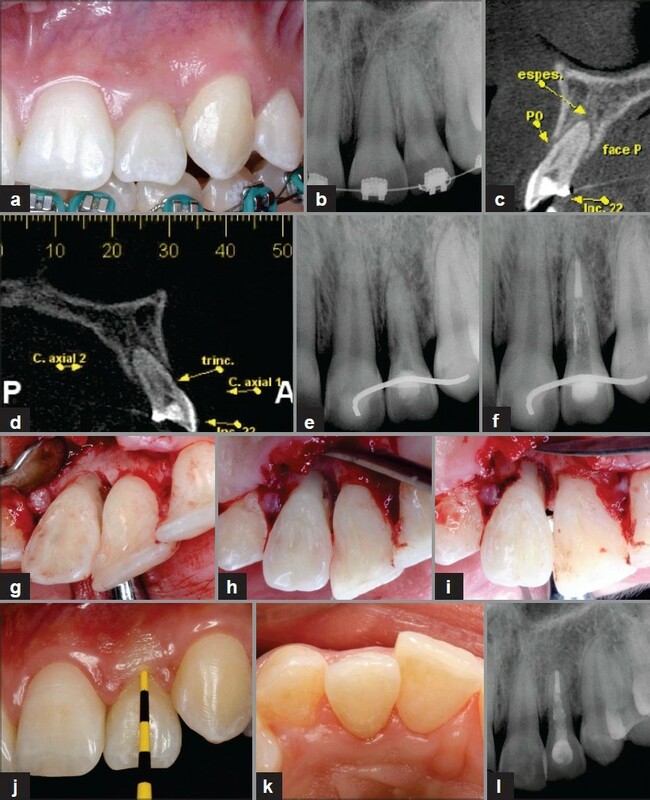 Aim and Objectives : To evaluate the cervical marginal microleakage of class II packable composite resin restorations using flowable composite and resin modified glass ionomer as intermediate layers and whether the difference in the thickness of these intermediate layers would influence the microleakage. 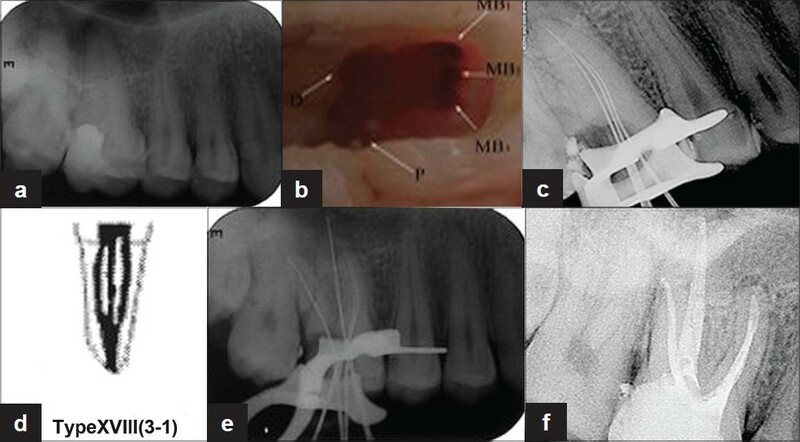 Materials and Methods : Standardized class II box only cavities (4 mm bucco lingual width 2 mm mesio distal depth with the gingival margin 1 mm above the cemento-enamel junction (CEJ) were restored as follows: Group A Restoration with packable composite alone, Group B, Subgroup 1, 1 mm flowable composite liner + packable composite, Sub Group 2, 2 mm flowable composite liner + packable composite, Group C, Subgroup 1, 1 mm resin modified glass ionomer cement (RMGIC) liner + packable composite, Sub Group 2, 2 mm RMGIC liner + packable composite, The specimens were thermocycled, stained with methylene blue, sectioned to evaluate the dye penetration. Data were analyzed using Kruskall Wallis Test and Mann Whitney U test. Results : There was no statistically significant difference between the groups. The difference in the thickness of the intermediate layers did not influence the microleakage. Conclusions : Use of 1 mm of flowable composite intermediate layer improved the sealing ability of packable composites than the differential thickness of resin modified glass ionomer. In the era of minimal invasive dentistry, every effort should be directed to preserve the maximum tooth structure during cavity preparation. However, while making cavities, clinicians usually get indecisive at what point caries excavation should be stopped, so as to involve only the infected dentin. Apparent lack of valid clinical markers, difficulties with the use of caries detector dyes and chemo mechanical caries removal systems carve out a need for an improved system, which would be helpful to differentiate between the healthy and infected dentin during caries excavation. Light induced fluorescence evaluation is a novel concept implicated for caries detection and for making decisions while cavity preparation. This paper describes a few cases that explain the clinical applicability of this concept, using the SoproLife camera that works on this principle. 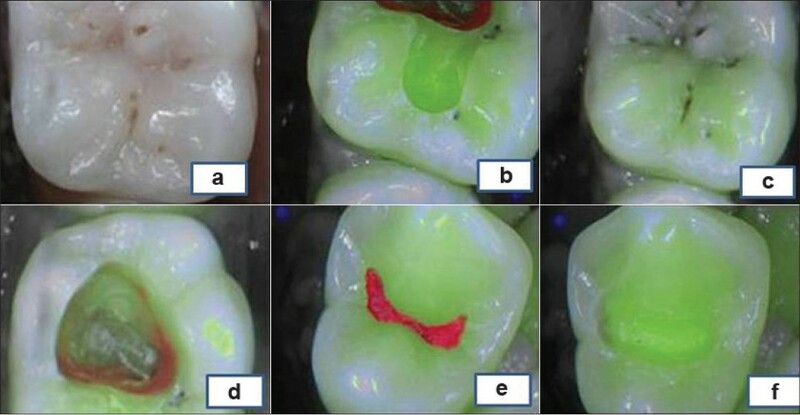 Autofluorescence masking effect was found to be helpful for caries detection and the red fluorescence in the treatment mode was found helpful in deciding 'when to stop the excavation process.' Light induced fluorescence evaluation - Diagnosis - Treatment concept concept can be used as a guide for caries detection and excavation. It also facilitates decision making for stopping the caries excavation so as to involve infected dentin only. 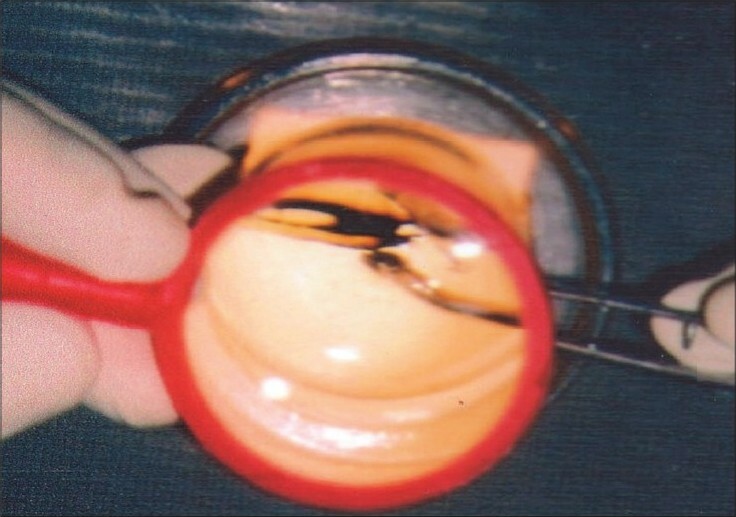 In comparison to the conventional apexification using calcium hydroxide, artificial apical barrier technique is more valuable and less time consuming. This article describes successful use of calcium-enriched mixture (CEM) cement as an artificial apical barrier in open apices. 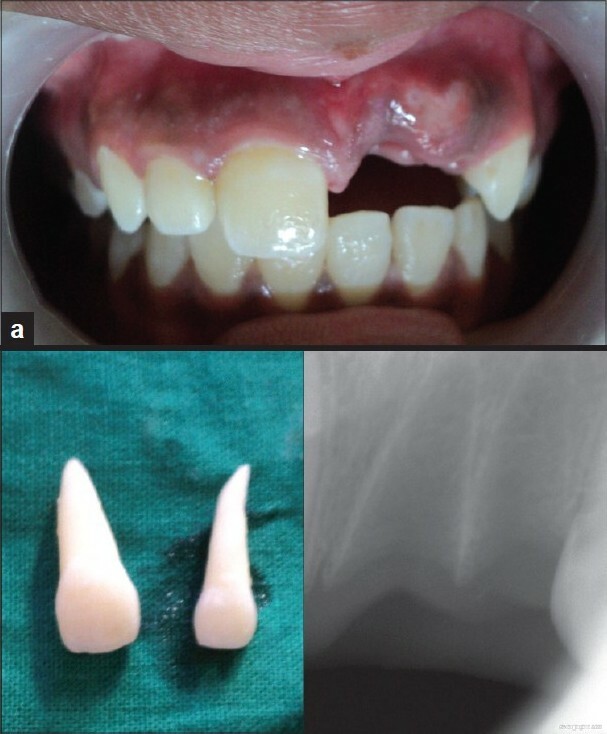 In this study, 13 single-rooted teeth with necrotic pulps and open apices were treated non-surgically. 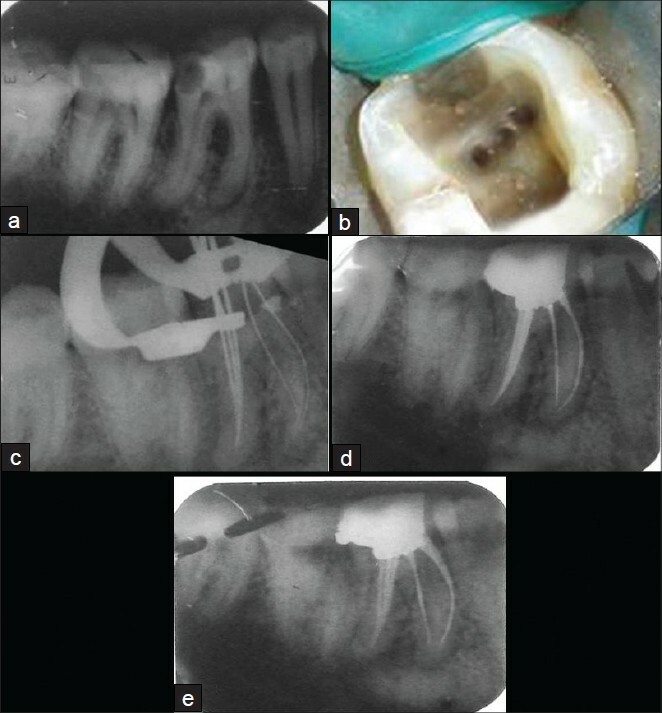 After copious irrigation of the root canals with NaOCl 5.25% and gentle filing, based on need for interappointment dressing, treatments were followed by CEM cement (BioniqueDent, Tehran, Iran) apical plug insertion in the first or second appointment. All cases were then permanently restored. All subjects were followed until radiographic evidence of periradicular healing was seen (mean 14.5 months). Clinically, all cases were functional and asymptomatic and complete osseous healing was observed in all the teeth. 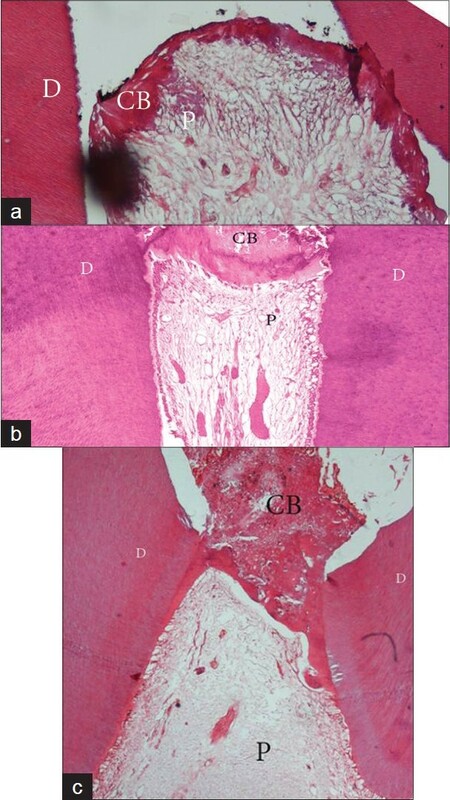 Considering the biological properties of CEM cement, this new endodontic biomaterial might be appropriate to be used as artificial apical barrier in the open apex teeth. Facial trauma resulting in tooth avulsion results in problems of physical and emotional nature for the patient and a challenge for the dentist. Avulsion accounts for 0.5-16% of traumatic injuries in the permanent dentition that can occur at any age and is most common in the young permanent dentition. As an emergency procedure, it is advisable to replant a traumatically avulsed tooth, but unfortunately long-term success is rather low. 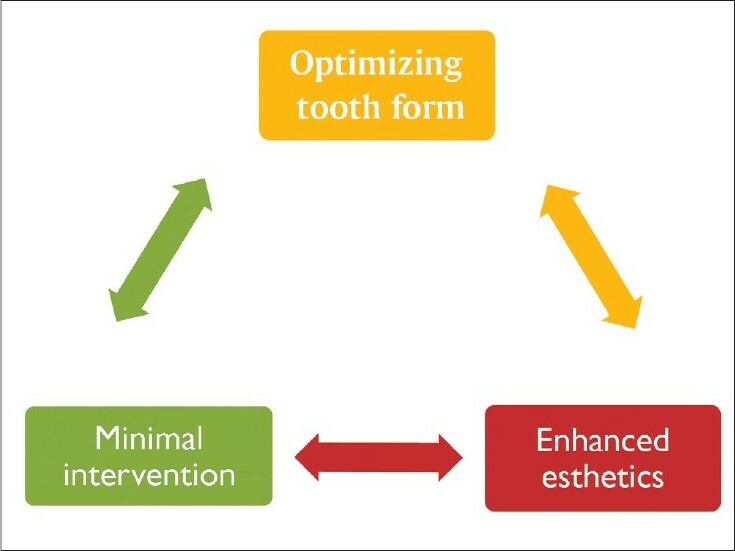 After unsuccessful replantation and subsequent extraction, it is prudent to replace the lost tooth to avoid aesthetic, masticatory, and psychological difficulties and also to prevent arch length discrepancy with various alternatives are available for the same. 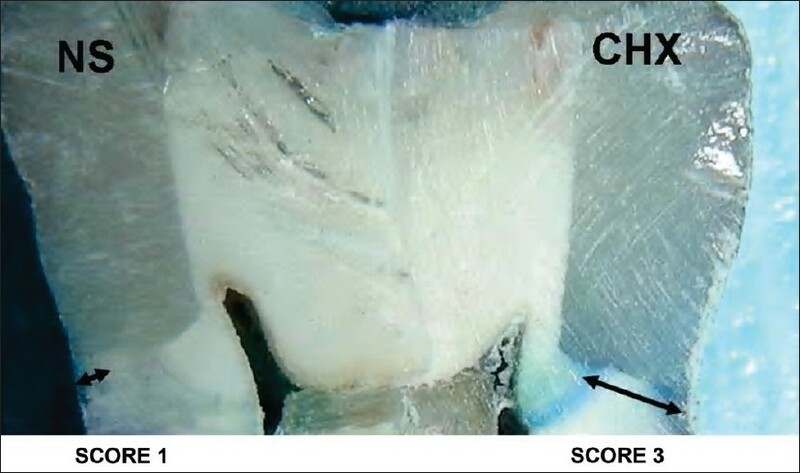 We presented a method for management of one of the two replanted teeth that showed failure, using the natural crown as pontic in a fixed semi-permanent bridge until a more definitive prosthesis can be fabricated at a later age for better patient compliance. This clinical case report describes the diagnosis and treatment of an external invasive cervical resorption. A 17-year-old female patient had a confirmed diagnosis of invasive cervical resorption class 4 by cone beam computerized tomography. Although, there was no communication with the root canal, the invasive resorption process was extending into the cervical and middle third of the root. The treatment of the cervical resorption of the lateral incisor interrupted the resorptive process and restored the damaged root surface and the dental functions without any esthetic sequelae. Both the radiographic examination and computed tomography are imperative to reveal the extent of the defect in the differential diagnosis.